A dissection of the Soviet Union's legacy of health and environmental disaster, this book examines a former country of 103 cities - home to 70 million people - where the air is unfit to breathe and pollution fouls 75 percent of the water. Feshbach, Murray, and Alfred Friendly. 1992. 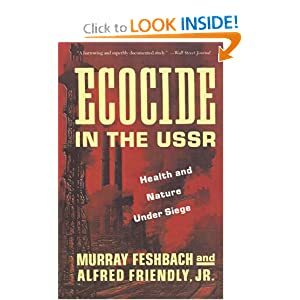 Ecocide in the USSR: health and nature under siege. New York, NY: BasicBooks. Includes section (p.256) "The Prices of Cleanup".